...well, to me anyways! 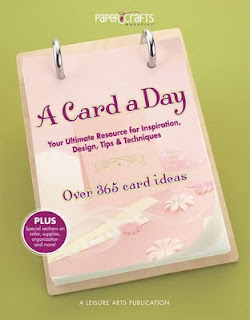 I have a couple of cards to share with you today! 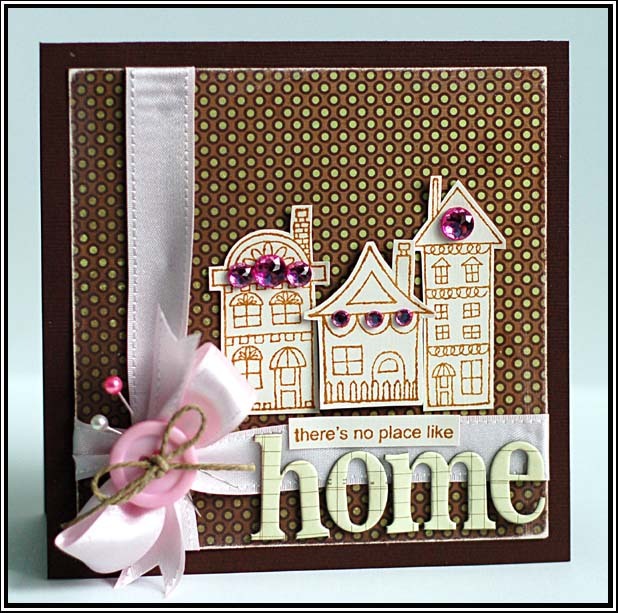 For the first one, I used FTL 70 from the Clean & Simple Stamping Blog. 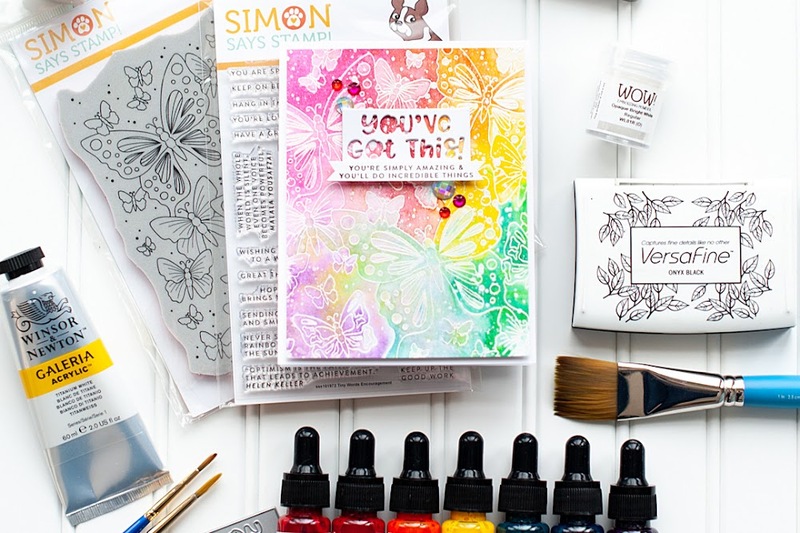 I am so happy I found this cute little blog...the sketches are fabulous, as are the projects! I didn't do a lot of stamping on this one- just the sentiment because I wanted to focus on this cupcake cut from one of my new Cricut cartridges!! It is called "Sweet Treats", and it is awesome!! I can't wait to use it more! 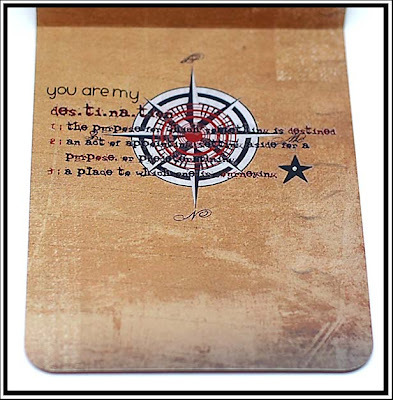 Card Instructions: Round the right corners and ink the edges of a block of heart paper with warm red chalk ink. Adhere to the front of a white card and round those right hand corners. Ink the edges of a strip of striped paper and adhere to a white cardstock block. Round the right hand corners of the block and adhere to the front. Add pink paper frill and aqua dotted ribbon over top of the seam, and accent the top with a bow. 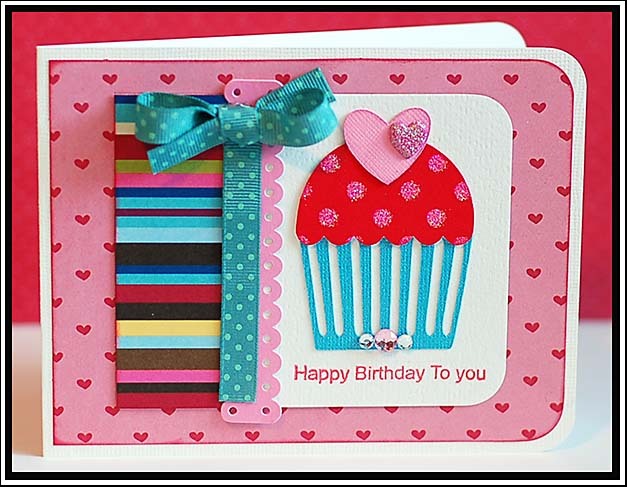 Cut the cupcake layers at 2.5" using the Cricut Expression and Sweet Treats cartridge. Ink the edges of the frosting and heart cuts. Layer the cuts together to the white block. Accent the heart with a glittery brad and the bottom of the cupcake with three jewels. 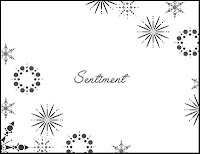 Stamp the sentiment directly below the cupcake cut with Ladybug pigment ink. 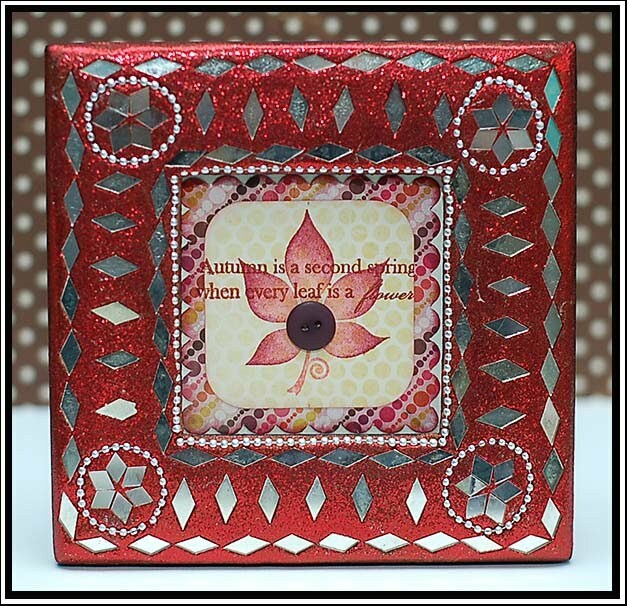 My next card is made completely from scraps and product that I have been sitting on for awhile! I think it is always good to focus on using up the scraps in my scrap basket, so I am going to try and make one card per week using only that basket. 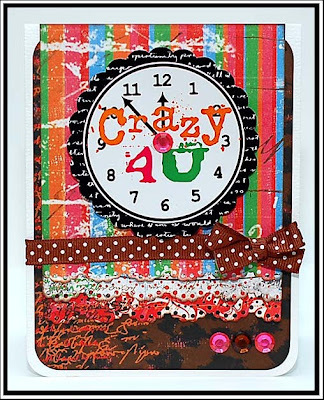 My card completes Crazy For Challenges Week 13 to use punches, and it is based, albeit loosely, on Sketch Saturday #79. 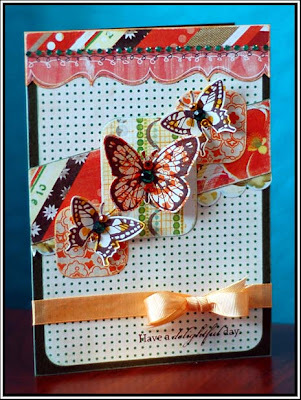 Card Instructions: Punch two Apron Lace borders to yellow dotted paper and adhere to the top & bottom of a kraft card base. Adhere a block of white cardstock to the front. Round the corners of a block of green dotted paper and adhere to the left side. 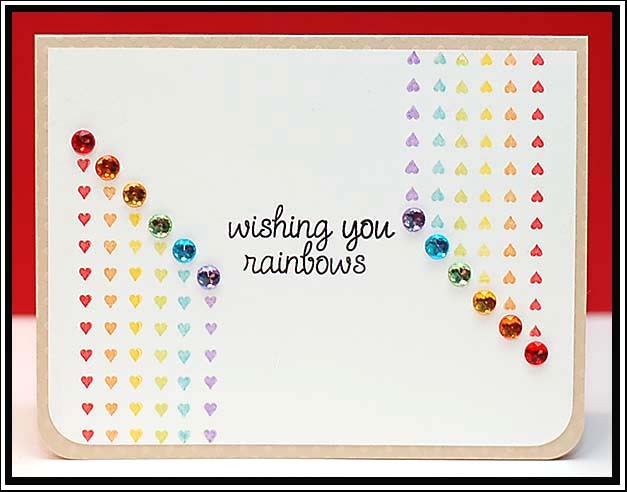 Cut rainbows from patterned paper and adhere to the front. 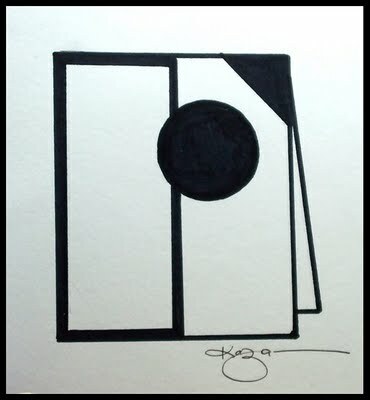 Round the corners of a block of blue dotted paper and white cardstock, and adhere together. Affix to the front of the card, and stamp the sentiment to it in Scarlet pigment ink. 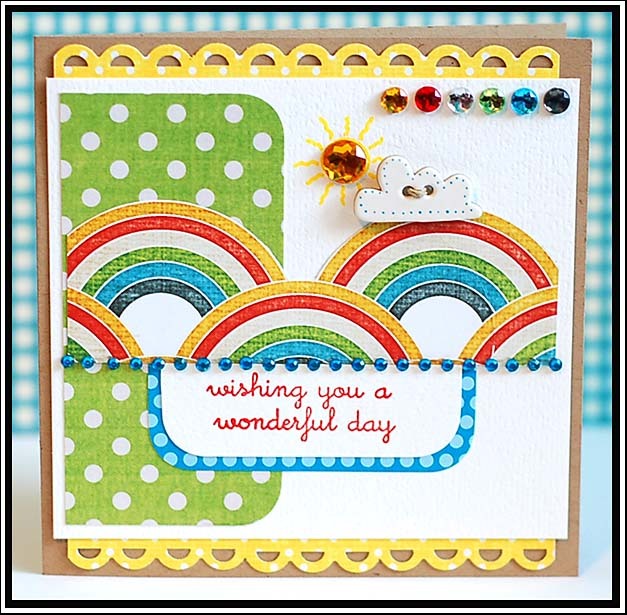 Stamp the sun above the rainbow paper using Canary pigment ink and adhere a yellow jewel to the middle of it. Accent with a chipboard cloud and rainbow colored jewels. It was so funny, and has a really sweet ending. It is a bit crude though, so just to warn you. If you can get through the crudeness...it is a really great movie! Still listening to my Christmas music...loving it! If you haven't heard the song "Mistletoe" by Colbie Caillet...here it is on youtube. Loving this song! ....that I am completely addicted to jewels, and have been for a long time! Tee hee! 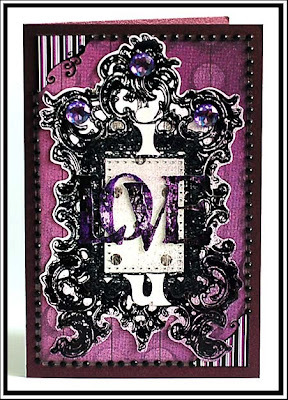 :) Lots of jewels used on this card, and I love it! I did this for the Caardvarks "Color It!" challenge, and it is also based on The Sweetest Thing Sketch #46. I decided to paper piece my stamps rather than color them in...I think these stamps look better that way. 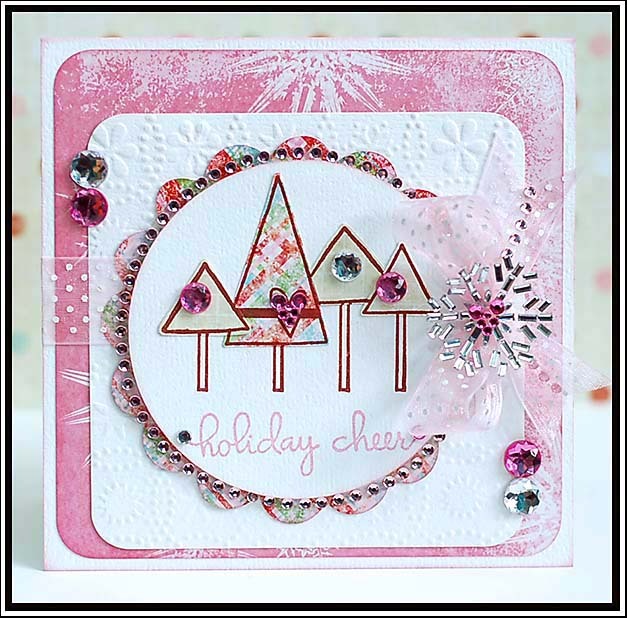 Card Instructions: Round the corners and ink the edges of the pink snowflake paper block with pink pastel chalk ink. Adhere the block to the middle of a white card base. 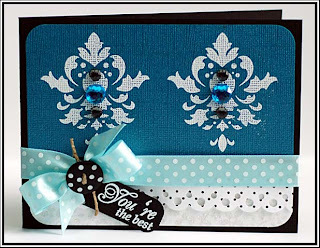 Dry emboss a block of white cardstock with the Cuttlebug machine and Snow Dots embossing folder. Round the corners and adhere to the front. Cut a 4" scalloped circle, and a 3.5" circle using a Cricut Expression and the Storybook cartridge. 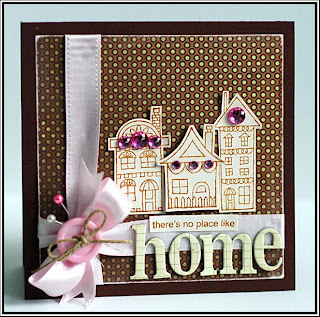 Ink the edges of the scalloped circle, adhere to the front, and add a strip of ribbon to it. Stamp the tree images to the circle with brown pigment ink. Stamp the same image to two different patterns and cut the tree tops out. Adhere them to the circle image. 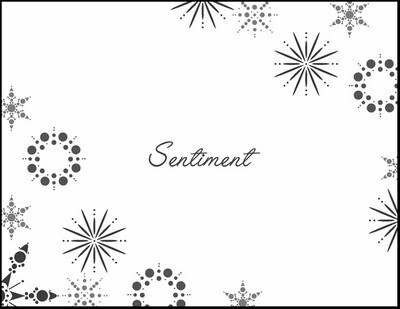 Stamp the sentiment below the trees using Dusty Plum pigment ink. Adhere the circle to the scalloped circle using foam adhesive to give it some dimension. Add a bow to the right side of the circle, and accent the entire card with jewels. What are some of your favorite Christmas albums? I am really enjoying the one above, and I really like the Wow Christmas compilation albums. I would love some others to check out, so let me know! Happy Friday evening! To all you brave black Friday shoppers...I hope your day was blissful. Mine was...just a lazy day in the quiet comfort of my home. I don't do well with really large crowds of people, so I don't consider black Friday shopping a fun thing. Instead, I got my kitchen all cleaned up from our Thanksgiving feast, spent a little time in my craft room, and watched a movie with my dad. My poor hubby is working from 9a-11p, and then goes back in tomorrow from 8a-8p. This weekend is always killer for him...I hate that part. I have a couple more Autumnal items to share with you before I start getting into Christmas and winter mode! First up is a card based on Get Sketchy #16. ANOTHER great sketch site I found while blog surfing...totally loving all the great challenges I am finding! 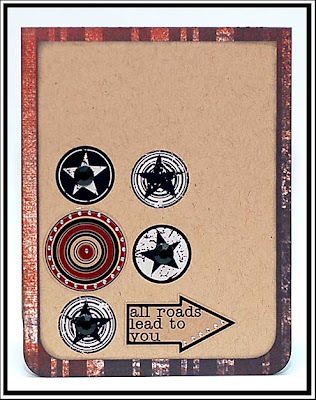 As you can see...I am a little obsessed with this sentiment stamp. I just adore it!! I have a couple more little blessings that I am thankful for to share with you. 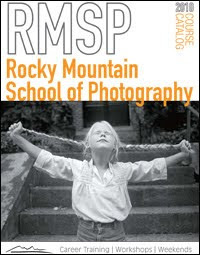 This may seem odd, but I am so thankful for my experience at Rocky Mountain School of Photography this year. It was such an amazing five months. I grew so much as a person, I made so many wonderful friends, and learned more than I think I ever have in such a short time period. I will forever be changed for the better because of my experience, and I am so grateful for the school, its staff and instructors. I was lucky enough to make it into the catalog this year, which I included the cover image of (I am not on the cover, I am inside.) If you go to this link and look at the right side of the page...that is what I have on the inside of the catalog. My designer's copy came in the mail this week, and I was so surprised! It was a nice surprise though, and the book is gorgeous. 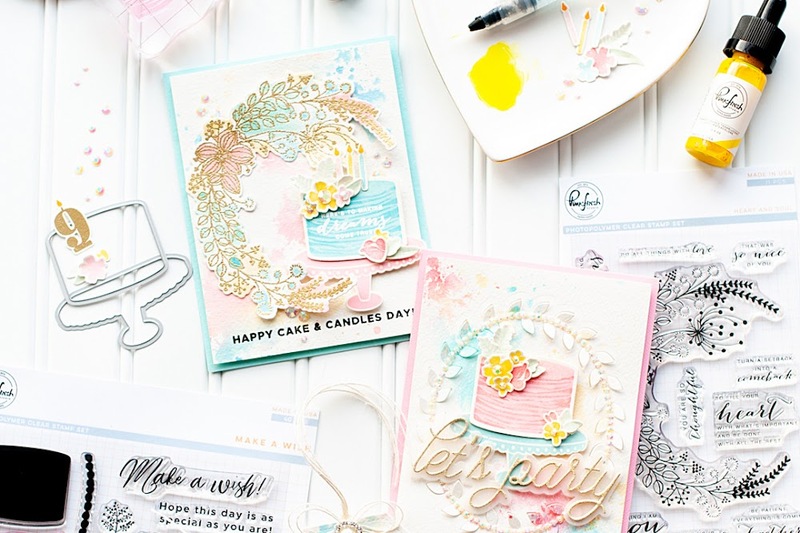 Full of amazing talent....so honored to be a small part of such an amazing group of cardmakers in this world! Due to a very early cold spell, Montana didn't get much of an autumn. We normally have a few weeks of beautiful and rich colors, daily changing as the temperature slowly drops. Unfortunately, the cold snap just caused all the leaves to die and fall off the trees. But, I am grateful that I was able to travel to the east coast to photograph my friend's wedding, because I got a small glimpse at the beautiful colors of autumn. It was such a blessing, and it was so gorgeous. Our parents. They say that when you become a parent...you wear your heart on the outside of your body. I don't think I truly understand this yet, considering I don't have children. But, I can see that it is true. Our parents have shared in our joys and triumphs, and felt the pain of our heartaches our entire lives. 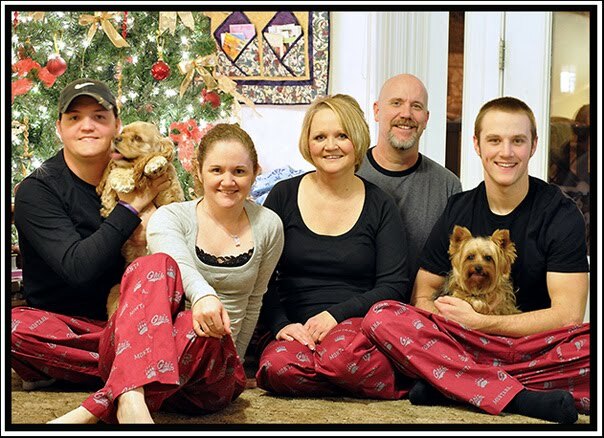 We wouldn't be the people we are today without them, and I know I am so very thankful to have them. They make holidays special, no matter how big or small. And they support us in everything we do. You can't ask for much more, but it seems like they give so much more. I love them and am so thankful for the blessings that come in the form of my mom and dad. I have a song to leave you with tonight....it is awesome. Hope you like it. I have a Thanksgiving card to share with you today. It is based on Kazan's sketch #40 at 2 Sketches 4 U this week. 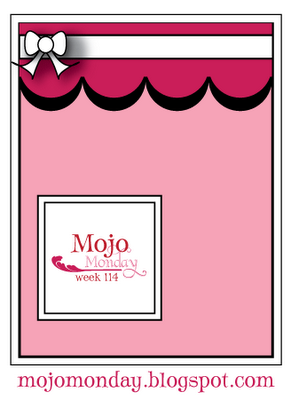 Lots of fabulous inspiration this week (as always), so be sure to check it out! Here is the card that I came up with. After rounding the corners and adding the strip of Sassafras paper, I stamped the border at the edge of the paper with vanilla pigment ink. I set that aside to dry so I wouldn't smudge it, and proceeded to cut a 2" circle and 2 1/4" scalloped circle using my Cricut Expression and the Storybook cartridge. 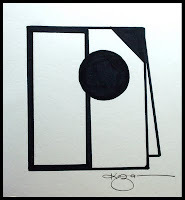 I stamped the leaf image onto the circle cut using two shades of chalk ink, and then adhered the two circles together. 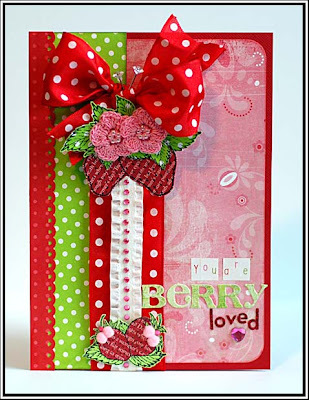 Added it to the front of the card and accented with ribbon, a bow, and some jewels. Added the rub-on sentiment...and voila. Done! This might be hard to believe now, but I wanted nothing to do with him when my mom told me she was pregnant. I was 10, and wanted to be an only child. Man, was I a selfish little thing, or what? But then he was born, and I met him...and I fell in love with him. Life as I knew it would just become better once he was born. He has made me less selfish, more loving, and so thankful to be his older sister. I just love this kid. Often people tell me that Casey is so lucky to have a sister like me. Honestly...he makes it pretty easy. 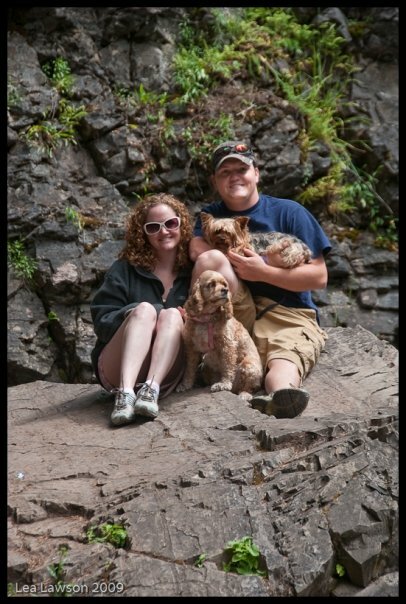 And I think I am pretty lucky to have a brother like him. As you all know...he is an amazing football player. Here are a few of my favorites from this season of football. "And the heavens shined down and declared....yes, you will be an amazing football player." I would like to say that I just have skill, but the light shining down on Casey was a happy accident. I just love the little bit of eye peeking out, right before he took this guy down. So, now I am going to brag on him a little bit. 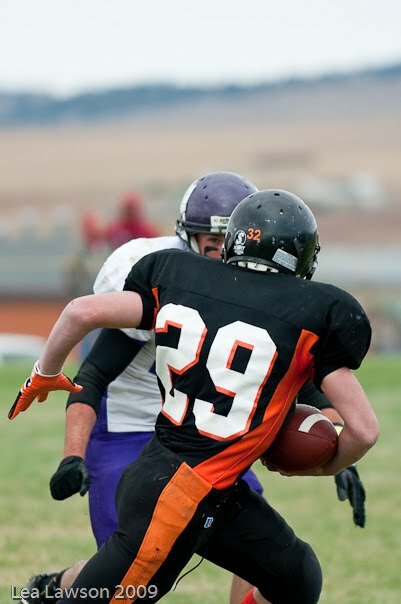 So far- five colleges in Montana have contacted him about playing football next year. I think three of the schools are actively recruiting him. And I am so excited for him!! His #1 pick is the University of Montana Grizzlies, which also happens to be my Alma mater. It is his dream, and it is my dream for him that it comes true. He absolutely has the skill, and has now put in a very successful football season that the coaches have been reading about and watching game film of. So, now we wait. And I am certain we will be hearing some good news come the first of they year! I decided this week that I wanted to do an entire week on Thanksgiving and what I am grateful for. I am so abundantly blessed in this life, so much so that it seems unfair almost, and I really wanted to share some of it with you. I would also love to get your feedback on where my blog starts to go from here. Now that I am finished with school, I do have a bit more time on my hands. So, I am making it a goal to blog more often. I have made the decision that this will not be a photography blog. My business will have its own blog for the photography aspect of my life, so I figured just letting you know that I have updated it would work better. I want to keep this blog more personal, more about crafting, and randomness. ♥ So, are there things you want me to blog about? Questions you want me to answer? What type of things will keep you coming? I have a couple of cards that I want to share with you. Do you want to know what I love about blog surfing? I find some of the greatest challenges while doing it!! 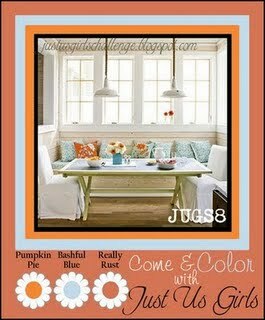 There is this great color challenge going on at a blog called "Just Us Girls". I had never checked this blog out before, and I am so glad I did! The color combo is fabulous....pumpkin pie, bashful blue, and really rust. So, this card is based on that color challenge, and the sketch at Mojo Monday Week 114. 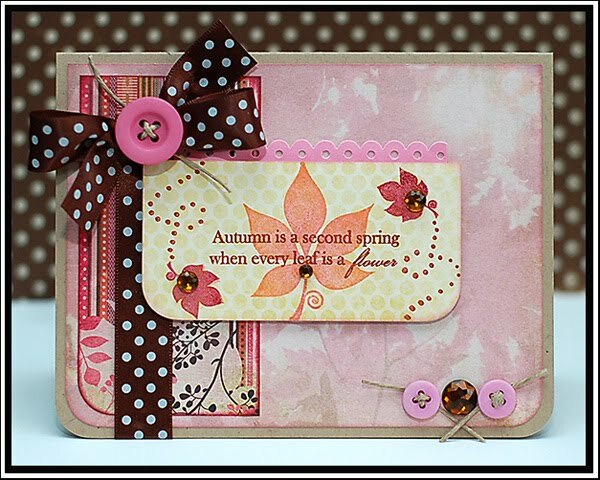 On the card I used two really cute stamp sets from Renaissance By Design. 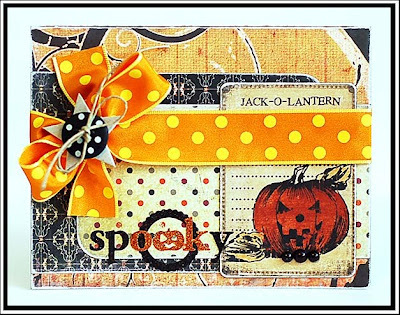 The pumkin & leaf images are from the "Halloween" stamp set, and the 'Thanks' part of the sentiment is from the "Curly Trees" stamp set. If you haven't ever checked out RBD...I suggest you do! I love the stamps...they stamp beautifully. It is really hard to see, but I also dry embossed a square around the pumpkin image. It adds so much to it in real life...I wish it would have photographed better! But...low light. What can you do?! I also have a non Thanksgiving themed card to share with you. My brain has been throwing around this idea with these stamps for awhile now...but I couldn't get the idea to come to fruition. While blog surfing...I found another keeper of a site called the "Clean & Simple Stamp Blog". They posted FTL #69 on Friday....and the lights went on! ♥ Love it when that happens! Alright...so now to get down to what I am grateful for, day #1. It is going to sound obvious and cliche...but this year couldn't have happened without it. I am so grateful for my wonderful husband's support this year. We made the decision together that I would attend photography school in January of this year. It was a leap...emotionally, financially...every "ally" word you can think of. He was right on board with me from the beginning. He kept me sane during all the crazy hours I kept. He cooked for the big BBQ bash we had at the end of summer intensive. He took care of the dogs at lunch time, which had always been my thing. He has financially supported us 100% since June. There is so much more, and he has never batted an eye at any of it. He did it willing, and in full support of my dream. What an amazing person I married. I am so lucky that 7 1/2 years ago I got to say "I do" to him. Now that I am out of school, he is keeping me motivated on my website, and getting my name out there. (Not from that place...I took the image off the internet.) So, here is the story. When Josh was in Turkey he told me that my Christmas present would arrive while he was gone. Sure enough....two boxes found their way to my doorstep. About three days after Josh got home from Turkey, he tells me that they actually aren't my Christmas presents and he wants me to open them. I declined at first, stating that we didn't need to keep spending money on me. It would be my Christmas present. Then he says that what is in the boxes was actually free. I give him the "whatever" look, but he persisted. I finally relented, because I knew he would just keep at it. 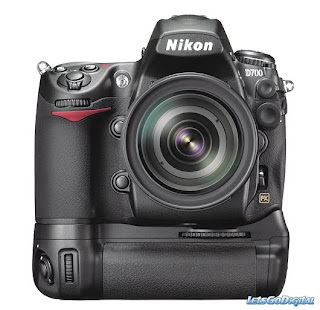 The boxes opened to reveal a Nikon D700 and battery grip. I cried. And I told him that they were not free, because I know full well how much they cost. He reveals that he cashed in some of his stock options to pay for it, so thus it actually was "free". And I cried a lot more. It makes me a little teary just typing it. Seriously...the man is just amazing. And I am SO grateful to God that I have him in my life...I am so not worthy. And the last thing I am going to leave you with tonight is a music post. I can admit...I am way behind the times on this one, but I was introduced to a band that I am loving right now. They are called Augustana, and they rock. You can totally let me know how behind I am...because you have probably heard their music for forever now! I'm okay with that...I deserve it! ♥ This is one of my favorite songs so far. Alright...I am going to get going for now! Sorry my post is forever long. I had a lot to say tonight! Hugs & ♥ to you! Well, I was hoping to get some cardmaking done this week...but I have been so busy getting some of my business stuff done instead. Working diligently on my website....I feel like it is coming along quite nicely. Can't wait to be able to share it with you!! Just wanted to give out a little reminder to the winner of my Glitz giveaway to email me. I haven't heard from Nancy G. yet....so please send me your address so I can get your prize off to you. If I haven't heard back by this coming Monday...I will draw another winner. 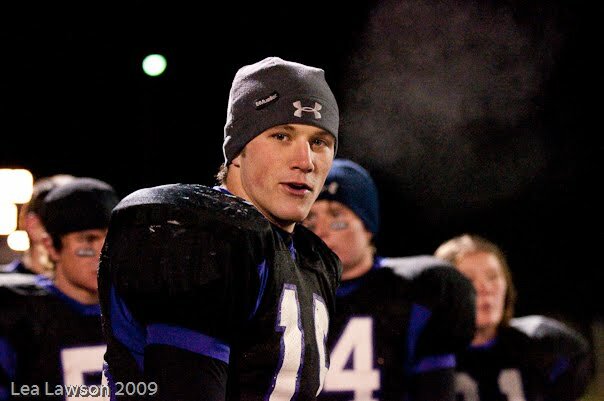 And my little brother, Casey, played his last football game of his high school career last Saturday afternoon. Unfortunately, they lost to Wibaux last week. We are SO proud of Casey's season, and really all 4 years of his high school football career. 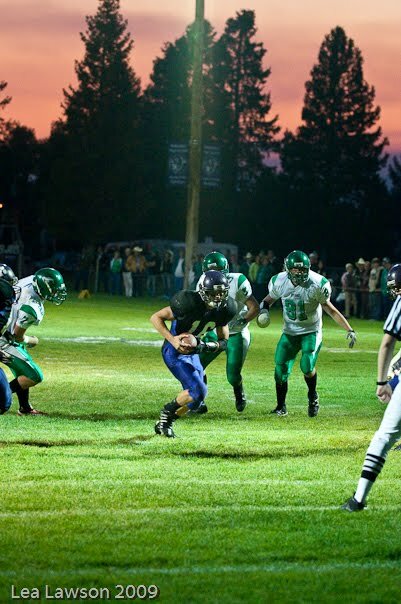 He has made quite a name for himself in Montana Class C football, and has been noticed by many. 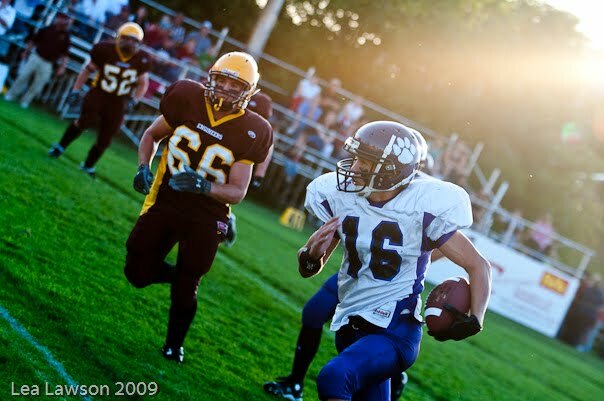 We know that we are going to see Casey out on that football field again at the next level! Now we wait to find out if he makes All-Conference and All-State. He should make both...so we are waiting for the good news!! Well, I have to run to the post office and to Target...so I better get going for now. 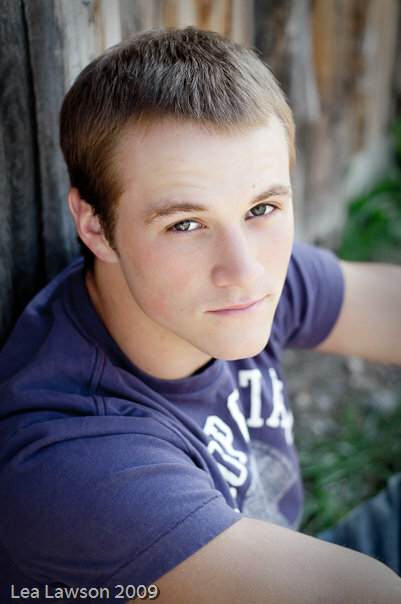 I have a senior portrait session in Sheridan tomorrow...should be fun!! I photographed his older brother last year. I have a Glitzy winner!!! Your cards are great. I really like the Olivia line. It's like vintage techno. I will have another post later today, or tomorrow! Have a great day! Happy Friday everyone! Hope your week has been a wonderful one! I took some senior portaits in Bozeman this week....like hours before it started to snow there- so we got them done right in time! We are going to be leaving for Sheridan in a couple hours for Casey's game tomorrow. This is the semi-finals of the playoffs...and it is going to be a very hard game. But I have faith that they can win it...and make it to the state championship next weekend!! So- if you can, keep my brother and his team in your thoughts the next couple days. Kickoff is at 1pm tomorrow afternoon! 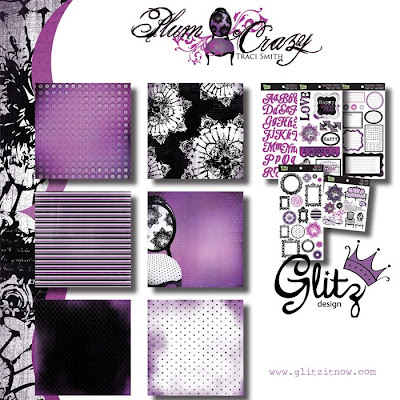 Well, I have wanted to focus on one of Glitz's latest lines today called Plum Crazy. 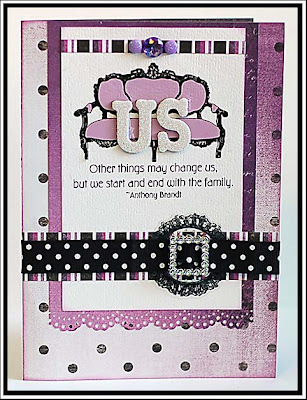 I just adore this line...plum is all the rage these days, and they used it beautifully in this line. 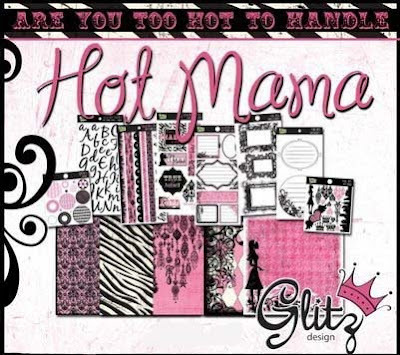 Speaking of Glitz Designs...don't forgot that I have a BIG giveaway going on at THIS POST. 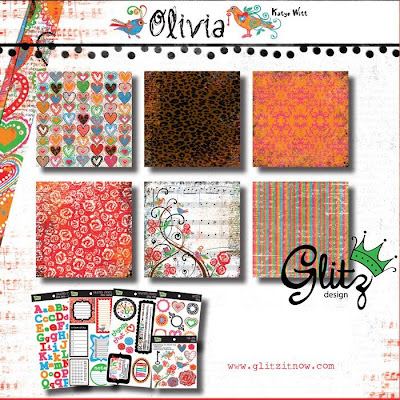 Be sure to read it and leave a comment in order to win all of the latest Glitz releases. All comments must be made by Sunday at 11:59pm MST. I actually had time to play at 2 Sketches 4 U this week!! 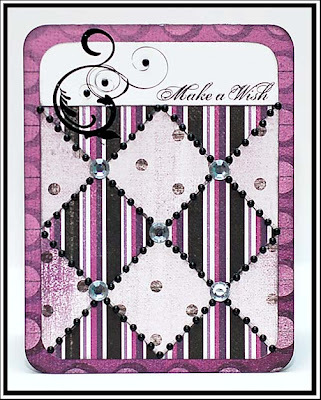 This is my card using Kazan's sketch 39...still loving these sketches even though it has been such a long time. 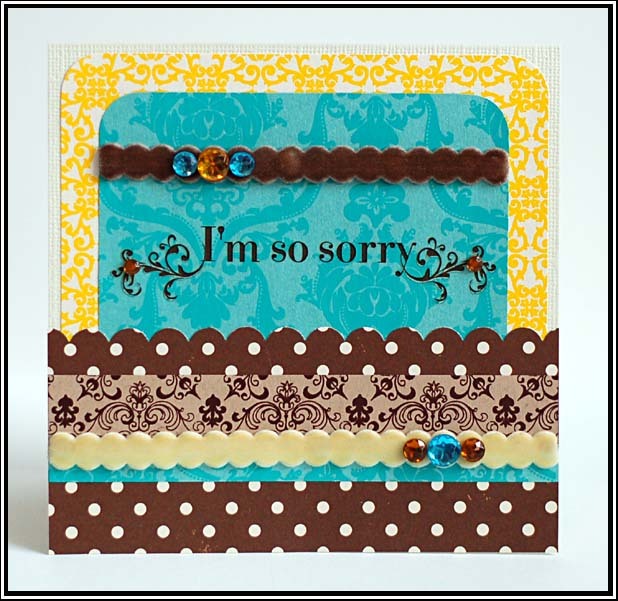 And then I have a small detour....using the Glitz Design's "Detour" line on this card. :) I know...I know. Anyway...this uses the current sketch from the CPS blog, sketch 141. 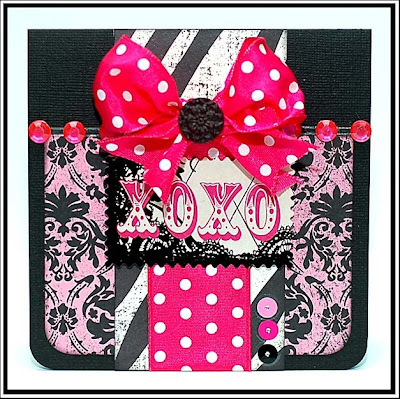 Hop on over and check out all the other cards....they are fabulous!! 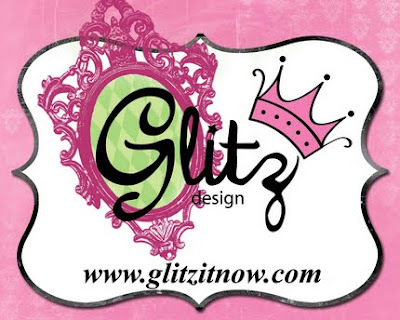 Have you become a fan of Glitz Designs on Facebook yet? If not, now is your chance! Head on over to the Glitz Designs Facebook Page, and become a fan! It's the best place to find all of the latest Glitz information! 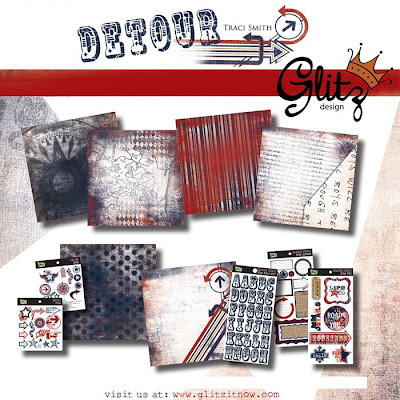 You can also find lots of inspiration at the Glitz Designs blog, so be sure to check that out as well. You have until this coming Sunday, November 15th until 11:59pm to leave a comment. I will pick a winner and announce them the next day! Can't wait to hear what your favorite is! In the mean time...keep coming back this week. 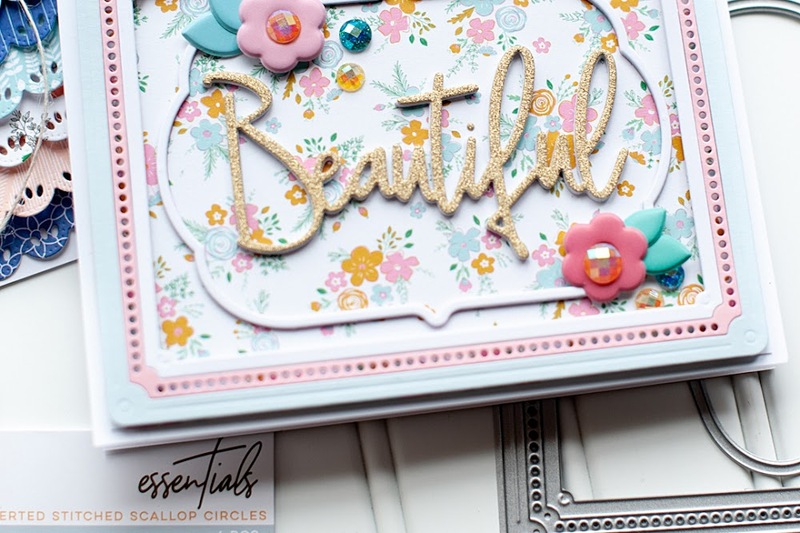 I have a lot more Glitz-y items to share with you!! ....how I love thee. :) I don't really purchase or subscribe to any magazines any more, but thank goodness for the internet. What a beautiful cover. 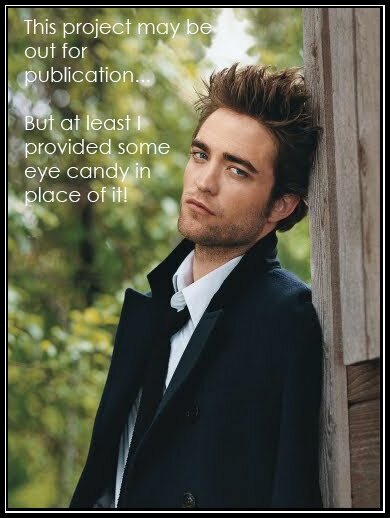 And just for a little more pure eye candy...here is an outtake from the same VF shoot. Oh to be the one behind that camera. Something I could totally get used to. Can I apply to be Robert Pattinson's personal photographer? I promise to do a REALLY great job! Tee hee! And the verdict is in on my favorite song off the New Moon soundtrack! 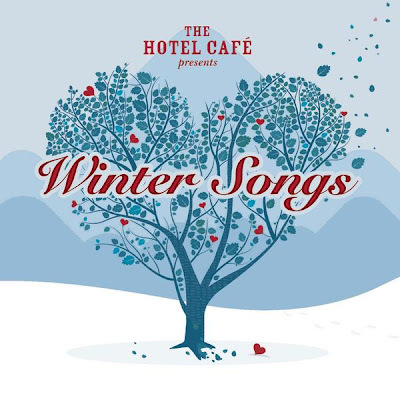 Of course, I love the main song, "Meet Me On The Equinox" by Death Cab For Cuties. But, I always prefer to find a favorite on the album that ISN'T being played all over the radio and television and internet. So, my favorite on the album is called "Possibility" by Lykke Li. The Twilight series lovers all know that this book is all about heartbreak and heartache. I don't think this song could capture that any more perfectly. There is a part of the song that goes, "So tell me when you hear my heart stop. You're the only one that knows. Tell me when you hear my silence. There's a possibility I wouldn't know." I think if you have suffered deep heartache in your life, you totally get those lyrics. Anyways...do you want to hear it? Here is a Youtube video of it...listen to it fast- it probably won't be up for long! Okay- now onto some crafting stuff. So- I am totally LAME, and didn't get my cute Halloween cards photographed until today. I know, I know. I am SO lame...I totally admit it. But, I don't want to not share them, so here they are. 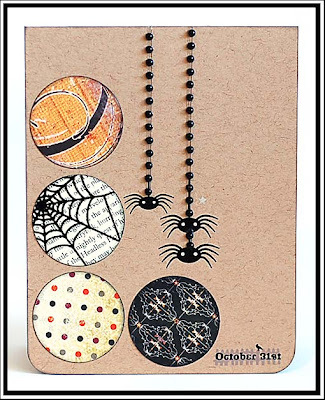 "October 31st" Supplies: Cardstock (Bazzill), Paper (Basic Grey/Making Memories/My Mind's Eye), Rubons (American Crafts/K & Company), Jewels (Kaiser Craft), Circle Punch (Marvy Uchida), Corner Rounder (EK Success), Ink (Clearsnap). 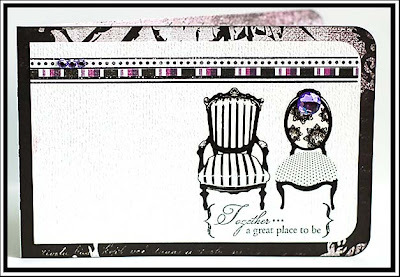 "For You" Supplies: Cardstock (Bazzill), Paper (Making Memories), Jewels (Basic Grey/Darice), Stamps (Renaissance By Design), Ink (Tsukineko/Clearsnap), Corner Rounder (EK Success). 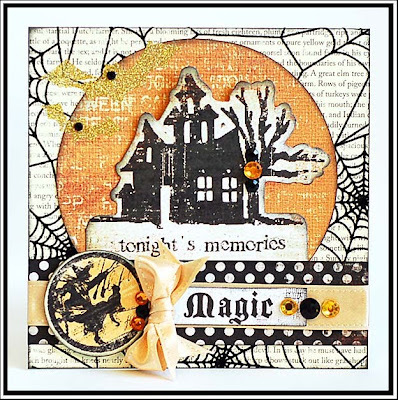 "Spooky Jack-O-Lantern" Supplies: Paper (Basic Grey/Making Memories/My Mind's Eye), Diecut (My Mind's Eye), Stickers (Making Memories), Chipboard (Maya Road), Button (Doodlebug Designs), Ribbon (Michael's brand), Twine (Darice), Pearls (Kaiser Craft), Ink (Clearsnap), Corner Rounder (EK Success), Sandpaper. 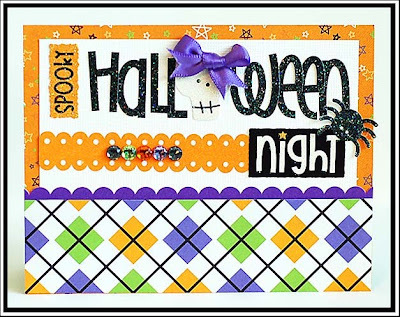 "Halloween Night" Supplies: Cardstock (Bazzill), Paper/Paper Frill/Stickers/Jewels (Doodlebug Designs, Ribbon (Offray). 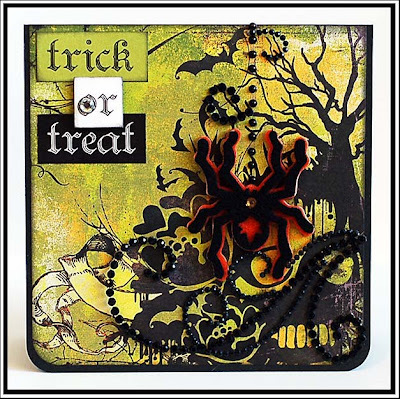 "Trick Or Treat" Supplies: Cardstock (Prism), Paper/Felt Sticker (Basic Grey), Diecuts (SEI), Jewels (Zva Creative), Ink (Clearsnap), Corner Rounder (EK Success). 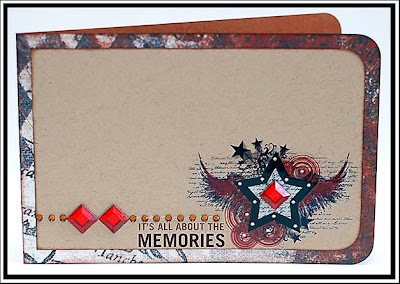 "Magic" Supplies: Paper (Making Memories/My Mind's Eye), Diecuts (Little Yellow Bicycle/My Mind's Eye), Rubons (We R Memory Keepers), Jewels (Zva Creative/Westrim Crafts), Ribbon (Renaissance By Design), Ink (Clearsnap), Circle Cutter (Creative Memories). 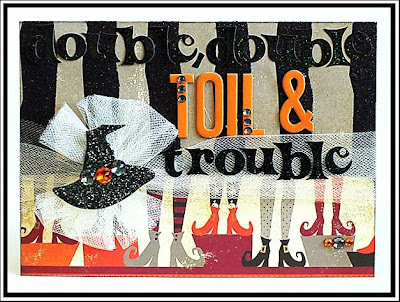 "Double, Double, Toil & Trouble" Supplies: Paper (Making Memories), Stickers (Glitz Designs), Chipboard (Heidi Swapp/My Mind's Eye), Jewels (Doodlebug Designs), Tulle (craft supply), Ink (Clearsnap). 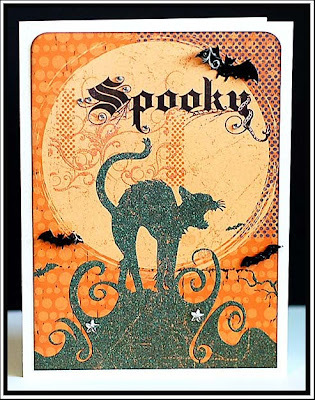 "Spooky" Supplies: Cardstock (Bazzill Basics), Paper (Little Yellow Bicycle), Stickers (Darice/Little Yellow Bicycle), Rubons (Basic Grey), Jewels (Westrim Crafts), Ink (Clearsnap), Corner Rounder (EK Success). So, forgive me for not posting these BEFORE Halloween! Really.....I am just trying to keep the spooky sweetness going for a bit longer. Tee hee! Enjoy your day!